We have recently been blogging about the addition of a new service we are now offering to our GIC customers. We now have an accredited HERS rater on staff. These ratings can be performed on new and existing homes. Read our previous blog on what a HERS rating is and how it can benefit homeowners here. We thought we would go over some of the components of these ratings in a series of blogs. Our first topic being the duct blaster. 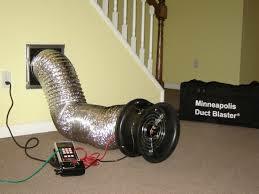 The duct blaster uses pressure to measure the leakage in an HVAC duct system. There are two types of leakage the duct blaster is able to test: total leakage and leakage to outside. The leakage to outside measures any leakage outside the conditioned space such as crawl spaces, attics and garages. Total leakage is all leakage from the ducts. Tighter ducts means more air is being distributed where it is intended to go. No one wants to be spending money to heat or cool their unconditioned attic. The duct blaster can also identify where the leaks are located. This can be especially helpful in new home construction as this test can be performed before the drywall is hung. This tool can be used in conjunction with a smoke machine to to identify where the system is leaking. Builders wanting to obtain credit for energy efficient housing will need to test out at a certain level of tightness. Using the smoke machine to ensure the ducts are tight while they are still accessible can prevent a lot of headache in the end. Once the drywall is hung there is little that can be done to identify and correct the leak. Leaky ducts are one of the biggest issues I see in new home construction. Sometimes it’s clear where the leakage is coming from like a disconnected duct in the attic that was somehow detached during the insulation install or sometimes it could be “death by a thousand paper cuts.” Every connection along the duct system runs the risk of leakage if not properly installed and sealed. Building a new home or making your home more efficient in 2014?